After every conference, I like to put down my thoughts about it and get a blog post out. A few weeks ago I had the pleasure of being a sponsor, presenter, and attendee at 360|Flex in Denver. The conference was great, as always, and I walked away with very positive vibes for the future of Flex. Although no one is too happy with Adobe, they are positive about Flex and the Apache foundation. Flextras was a sponsor of the conference this year, promoting our line of UI Components. The components are now free for production use. It is one step in our switch to advanced support. People seemed very positive about the move. We put together My speaker ratings were kind of middle of the road, but at least most people found the session informative. Ever since the rating app moved to mobile devices; the amount of comments available have gone down tremendously, which is a bit of a bummer. I'd love feedback if you happened to have seen my presentation. I'll be giving the same presentation at D2WC next week. The conference had a weird vibe during the Speaker Sponsor dinner. It felt a bit like a last hurrah. In some respects it was. Times are changing. Thanks to the advent of mobile devices the "it runs the same everywhere" stance is no longer guaranteed. I believe the use of Flash (or AIR) is going to be more focused; and discrete. For a while 360Conferences have added a "MVP" designation to certain people who have helped the conference in some manner. I got blessed this year to be one of those. John actually called me a "Business Mentor" up on stage when I was awarded my hoodie. I was amused by this, because I don't feel like a business success. I don't feel like a failure either, but I'm chugging along having fun. DotComIt hasn't grown to where I want it to be; but I haven't had to give it up either. John and I often bounce ideas off each other. I see it more of a peer relationship than a mentoring relationship. I don't have any magic secret business sauce. 360|Flex started as a "cool idea" to get a bunch of Flex Developers together and has blossomed into a conference company that extends beyond just Flex. They put on a Mac development conference and a iPhone developer conference. Some of the "beyond Flex" started to trickle into 360|Flex. There have been a bunch of non-Flex related sponsors and sessions this year such as Appcelerator and Sencha. As John said, the community around 360|Flex is about the work we're focused on doing; not a specific technology. As such the conference is being rebranded as 360|Stack. Next year will represent the full dev stack; whether that is HTML5 or Flex Development or something different. I can't wait to see how the next year unfolds. Flash Remoting won't connect "NetConnection.Call.Failed"
I've been doing some with for the Flextras promotions around 360|Flex. As part of the promotions I am creating a customized version of my Game; strictly for Flextras. It is going to allow people to login and will keep score on our server instead of internally to the app. I've tried a lot of different things including not using http instead of https. I knew that Flash Remoting was working on the production server because I had other Flex apps working without problems. So, what was the problem? Make sure your Flash Remoting URL has a '/' at the end of it. 'https://www.flextras.com/flex2gateway' was not working. It appeared to add a JSessionID on it; which was causing the server to throw a 404 error; causing the whole call to fail. However, if I changed this to 'https://www.flextras.com/flex2gateway/' that problem went away. Turn off the Flash Builder Network Monitor. The Flash Builder Network monitor was intercepting the call and causing it to fail. The calls appeared to work fine from a web browser with the Flash Builder Network Monitor enabled, but not from the mobile app. I think--but am not completely sure--part of my issues related to using HTTPS on the server instead of HTTP. That could be the reason I had issues on the production server, but not my local or staging box. I wrote two articles for InsideRIA when the site was still active. I'm purging my personal digital archives and came across them. I decided to repost them here for posterity. This article is about educating folks on how to move from MXML to ActionScript. I wrote the article in February of 2010; but it didn't get posted until later. You can find the original on this DevelopRIA site. I remember it being slightly controversial, but I'm not sure why. Sadly the comments do not seem to be archived. Here is the article. I often hear it said that all the cool kids write their Flex components using ActionScript without MXML. I'm not sure that I agree. MXML is great for layout purposes. It is great for building simple components quickly. The declarative syntax makes many development tasks easier, such as setting styles and adding events listeners. But, if you look closely at the Flex Framework source code or commercial grade components, such as what I build at Flextras, you'll notice they do not use MXML. Everything is built using ActionScript. Why is that? ActionScript gives you granular control over your code. MXML is an ActionScript generation language. The Flex Framework takes your MXML and turns it into ActionScript. That means the code you write, isn't the code that is running. If coding were cooking, using MXML would be like buying a cake mix from the store. You just add water and you're ready to bake. ActionScript is akin to starting with flour and choosing your other ingredients carefully. It takes longer, it requires more thought, but the results are often worth it. This article will show you how to move your component development from MXML to ActionScript. Along the way we'll touch on various aspects of the Flex Component Lifecycle. Often when you are building your own applications, in controlled environment, it will make more sense to build with MXML; and that is fine. But, understanding how to build from scratch using ActionScript will give you a deeper knowledge of how Flex works and help you build all your components better. Today, I want you to pretend that your boss asked you to build a survey application. As with most surveys, this application includes a bunch of questions, and needs some way to collect answers. Many of those questions can be answered with a simple yes or no. 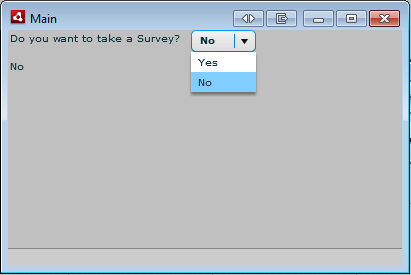 In a normal situation, you would collect yes and no answers using radio buttons. Unfortunately, and try to stretch your imagination with me on this, your boss is a bit irrational. He hates radio buttons. You're never quite sure why, but it is what it is. Instead of a radio button, he insists that you use one of those dropdown select box thingies. Fine! We can work with that. Knowing that your survey is bound to have a lot of yes and no questions, you decide to make a component out of it. We are already making our first use of ActionSCript in this otherwise MXML component. The dataProvider of the ComboBox is coded in script. It contains two objects, one for yes and one for no. Unfortunately, this component is still lacking in functionality. When using this component, how do we specify the question text? Your developer could access "question.text", but it would be nicer if we gave them a simpler way. How do we know which answer the survey taker has chosen? We'll need to add a property to expose that value too. Data Binding ties the questionText to the text display. You can use the change event to update the selectedAnswer each time you the ComboBox value changes. For all intents and purposes, this component would work for what we need it to do. It's time to test it. The question and answer field are both exposed. By creating them in MXML, they are treated as public properties. What would happen to our component if someone changed the dataProvider on the ComboBox? You want to prevent this type of meddling as much as possible. To address this we are going to turn our MXML components for Text and YesNoQuestion into protected ActionScript variables and make use of the Flex Framework's component lifecycle createChildren() to create the components and add them to the stage. The createChildren() method is run during the component's initial setup, and is intended to be used to create children and add it to the parent container. When dealing with ActionScript States, I'll often initialize any AddChild or RemoveChild state elements in createChildren(). I do this in the Flextras Calendar component to implement day, week, and month views. To keep the selectedAnswer variable in sync with what is going on, we were responding to the change event and setting the value. Our new approach will be the same, but we'll set up the event listener and the event handler in ActionScript, not using in-line MXML. createChildren() is initially defined in the UIComponent class. All Flex User Interface Components extend UIComponent, and ours is no exception, even though we are down the chain a bit. To implement it in our YesNoQuestion component, we override the method signature and call the super method. When overriding methods, it is important to call the super method. You never know what code magic may be executing higher up in the chain. Then the component creates the question Text instance and answer ComboBox instance. It sets the default value and adds it to the container. The listener function accepts an event argument. The single line of code inside the method is the same that we used in-line in our MXML version. What happens if the questionText is still an empty string when the createChildren() method is called? Our question will have nothing to display. There is nothing in our current code to update the question text if the questionText property changes. There is a solution. The Flex Framework provides the commitProperties() method to run code after all the component's properties have been set. We will make use of this method to set and update the question text whenever the value changes. I want to point out that there is nothing code related that will prevent you from having a get method and set method with different access modifiers. But,the ASDoc tool does have a problem with it, which is why I just remove the space between the set and property name. If you don't use ASdocs, feel free to make public getters and protected setters. Run and test the code and you'll find that we can change the question text without any issues; and the read only selectedAnswer property is still changing the main application's Text component when it changes. Things are good. The package definition is the folder structure where the component is located. So, in my application the YesNoQuestionV4.as file is located in the MXMLToAS3 directory of the InsideRIA directory of the Flextras directory of the com directory. The com directory is located off the main source root. This piece was masked from us in the MXML alternate. The only difference between these and the previous MXML Version is that we are importing the HBox, which our component is based off of. The imports were also in a script tag of the MXML component. In the ActionScript version, there is no script tag; in fact there are no tags at all. In this sample, the constructor does nothing other than calling its' parent's constructor. But, I'll often use it for defining default styles or performing setup of the component's states. Any code that you commonly write in response to the creationComplete event most likely belongs in the constructor; however MXML components do not support constructors. Even though your component is now 100% ActionScript, our main application does not have to change. In a true nod to implementation hiding, the application, or other component, that uses your components do not care whether it was implemented in ActionScript or MXML or some mix of the two. That is the only line of code that needs to change, but we do need to make some additions. There are two Flex component LifeCycle methods we haven't implemented yet, measure() and updateDisplayList(). Implementing these two methods will finish our component. The purpose of the measure() method is to decide in the ideal height and width that your component needs without showing scroll bars. A component's parent is ultimately responsible for its' size, so the measure() method is really just setting suggestions, via the measuredHeight and measuredWidth property. The method overrides the parent, and calls the super version of its method. Then it calculates the measuredHeight by adding the measuredHeight and measuredWdth of each child, respectively. In most cases, the measure method just loops over the children and calculates the values similar to what we've done here. The measure() method can, optionally, set the measuredMinWidth and measuredMinHeight properties. These properties specify how small the component can go before it stops sizing down. I did not specify those values here, but often default them to 100 just so that they have a value. I've run into odd issues when using percentage heights on components that do not specify the minimums. updateDisplayList() contains to arguments, the unscaledWidth and the unscaledHeight of the component. These values are, essentially, the height and width that you want to use to size your component. To position the components, use the move method. The first one, question, is positioned at the top left corner, with an x position of 0 and a y position of 0. The answer component is positioned next to the first one, with a x position equal to the width of the question instance. The answer's y value still remains 0.
setActualSize() is used to size the components. In this case, we use the two methods: ,getExplicitoOrMeasuredWidth() and getExplicitOrMeasuredHeight(). Since we never set an explicit height or width, this sets the components to their measured height and width. Before you start to build your components, think for a second. Are these components that you want to optimize for reuse and use in a lot of different places, and a lot of different ways? Or are these onetime components that you want to build for your application? Even if you can build everything in ActionScript, it may not be worth your extra time. But, even with MXML components, you can still make use of the ActionScript techniques and Flex component lifecycle methods to make robust components. For the same of completeness, the final code follows the end of this article. If you're scared that Flash is dead; I can understand the fears. Adobe has been stomping us into the ground as if were the ashes of a freshly smoke cigarette. I expect 2012 will be a year of transition for Flash Platform Developers. It may be because we have bitterness towards Adobe, or that we want to "follow the jobs", or just because we love learning new stuff. We'll spend a lot of time learning new technologies, such as Objective C, Java, and HTML5. Learning all that new stuff will make us smarter, and better, developers all around. The 360|Flex schedule is full of sessions on these alternate technologies. If you're a Flex Developer and are looking for your next steps, this is a great conference to go to. I'll be speaking on building games with Flex, and explaining why that is probably a bad idea. There will be tons of good info you can take with you back to Enterprise apps, especially in the mobile space. I think there is a good chance that I'll be paying the bills by Flexing long beyond 2012; but that won't stop me from learning new stuff. Swing by 360|Flex in Denver this April 15th-18th and say Hi to me. There have been a lot of emotion in the Flex and Flash community over the past few days; regarding certain decisions that Adobe has made about Flex and Flash and their utter failure to communicate with us, the developer community. The news, and responses, have been overwhelming negative. I grew up an eternal optimist. While I see a lot of challenge ahead, I also see a lot of opportunity. Here are seven reasons I'm happy to be a Flash Developer today. Adobe is focusing their Flash related efforts to allow us to easily build cross platform native applications. Let's face it; on mobile devices native apps are lot cooler than browser based apps. Flex being released to 3rd party open source foundation, most likely the Apache Foundation. This is kind of like the Spoon project with a +10 power up. "We are preparing two proposals for incubating Flex SDK and BlazeDS at the Apache Software Foundation." A lot of Adobe's Flex Roadmap discussed at Max will be implemented to completion, including the new Falcon Compiler, and some new spark components. Additionaly, Adobe will continue with Flash Builder, which is Adobe's best ActionScript editor. The next version of Flash Player will be developed on Desktops; and that is all many Enterprise Applications Need anyway. "We are already working on Flash Player 12 and a new round of exciting features which we expect to again advance what is possible"
Adobe wants to use the Flash player to continue to extend the web. Many of their innovations will be used a test bed to bring things back to formal HTML standards bodies. PixelBender turning into CSS Shaders and the poster child of this approach. "We will continue to leverage our experience with Flash to accelerate our work with the W3C and WebKit to bring similar capabilities to HTML5 as quickly as possible"
This approach is good for web standards; and good for all developers. We could easily argue this is what early browser makers did, and continue to do to move forward HTML. Many of the skills we have developed using Flash Platform tools will be easily applicable to the next generation of HTML5 related tools. That can give us a head start in the job market. Adobe is going to be adding HTML5 support for many of the tools we already know, such as the Flash Professional export to HTML feature. And If all else fails, HTML approaches to cross browser development will take 2-8x longer depending on the tasks at hand. You can laugh all the way to the bank. I don't know how this will all play out. I don't know what the future holds for me, The Flex Show, or Flextras. But, I'm cautiously optimistic about what the future holds. How can I use the ColdFusion Builder Plugin with two versions of Flash Builder? I have both Flash Builder 4 and Flash Builder 4.5 installed on my machine; each as the stand alone install. This allows me to slowly migrate old projects to the new IDE as I need to without blowing up the machine at once. In addition to Flex Builder, I have ColdFusion Builder installed. ColdFusion Builder is installed as a plugin to Flash Builder 4. How do I use the plugin in Flash Builder 4.5? I was half way through a second install of the ColdFusion Builder plugin, when I decided to do some directory checking. And this directory had a file named cfbuilder.link. I believe it tells Flash Builder to look in that directory for the ColdFusion Builder plugin. I relaunched Flash Builder 4.5 and had the ability to create ColdFusion projects and all that jazz. It appears everything is working as expected. So, I'm good to go and all it took was five minutes moving a text file around. How do you create a Status Bar in Flex? There was a discussion over on the Adobe Flex forums regarding the support of a progress bar on Flex Mobile. I was getting flamed badly, but many friends on twitter assure me it wasn't my fault. A progress bar is a class that to "provides a visual representation of the progress of a task over time." It is often used for preloaders, or for loading other data, such as videos or movies. The poster insisted there were plenty of uses beyond that for a progress bar. Some of his use cases included the stats bar from a game, or display the percentage completed that a project. I didn't understand why you'd want a progress bar component for those. The purpose of a progress bar is to automatically change over time; whereas any of those options would require some external reference to change those values. A progress bar seems overkill. At least that is how things work in my version of the world. And I said so. And the poster responded with insults; sometimes claiming that I said things I didn't say; sometimes accusing me of being flame bait. Also check out the source code. This StatusBar component extends the UIComponent. It has one property, highLightedPercentage. The property is used to determine how much of the component will be "highlighted". The rest of the component will be the unhighligted state. I also added two styles to specify the color of the highlighted portion and the not highlighted portion of the status bar. The whole process took about 20 minutes; but was very cathartic for me. I do not understand why that thread flew off the handle. I was recently making a custom List Skin for a client project, and I was writing some code in the updateDisplayList() method to conditionally display the border around the list. If the list had no data, we wanted to display the border. If the list had data, we wanted the border to be hidden. You gotta love client requests, right? I was at a loss to solve the issue; and for a second I actually thought I had forgotten how the syntax for using "And" in an if statement. Even commenting out that line would not make the compiler error go away. Googling the issue brought no resolution, which is why I thought I'd post the solution. Apparently in the default Flex list skin, there is no CData declaration on the script tag. As such any script you write must be XML compliant. I have no idea why the skin does not have that in by default. Flash Builder automatically adds it when you create a script tag.